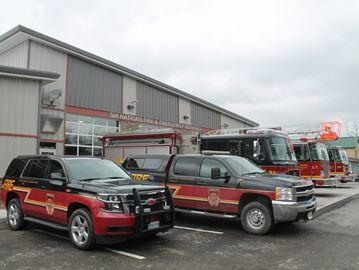 Six Nations Celebrates New Fire hall – built by Lanca Contracting Limited – LANCA Contracting Ltd.
Lanca Contracting Limited is very pleased with the completion of the Six Nations Fire Hall No. 1., a project which completed January 2016. On Thursday, April 7th about 200 people, including past and present volunteer firefighters, along with Lanca’s President Nathan Lancaster and Connie Martin the Project Manager, helped celebrate the grand opening of the new Six Nations fire department headquarters in Ohsweken. 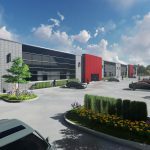 The new 13,000 square foot fire hall becomes Station 1, with three bay doors for three vehicles, operational offices, living quarters, onsite gym, secured storage lock up and a commercial grade kitchen. 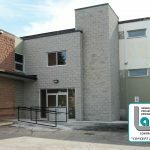 Full details of the project can be found on Lanca’s website under Ohsweken Fire Station #1 – New Building. 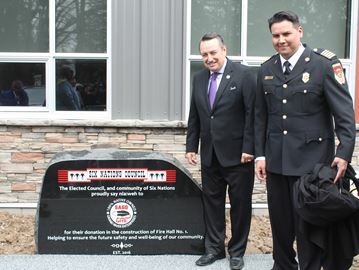 MIKE PEELING/BRANT NEWS Six Nations Fire Chief Matthew Miller unveiled a monument honouring a $2-million donation by Grand River Enterprises, represented by president Steve Williams, to the construction of a new fire and emergency services headquarters in Ohsweken. MIKE PEELING/BRANT NEWS Six Nations Fire and Emergency Services new headquarters had its grand opening ceremony on Thursday, April 7, 2016.